As a general rule, I avoid the hotel minibar at all costs. In fact, I've only broke this rule once in my life. I was once very hungry at about 4am and decided I needed a Snickers bar to tide me over until breakfast. That was the best €5 chocolate bar I've ever had. The minibar in the Amsterdam Hilton I'm staying at this week has a frightening message: it knows when I remove an item. I'm tempted to take out the €22,50 Baby Piper-Heidsieck just to see what happens. So when did this become a thing? You could try Indiana Jonesing it with a bottle of water? Oh, I like this idea... a challenge! OMG. These kind of mini-bars are SO ANNOYING for people travelling with a child that need the refrigerator. I move stuff around in there to make room for bottles of milk, sippy cups, etc. It upsets the sensors and upon check out, am told I owe zillions in mini bottles of pinot and mini bags of cashews. I tell them no I don't (am travelling with a toddler I need WAY BIGGER bottles of wine that that) they erase the charges, we all move on, but really, shouldn't such sophisticated technology be used for something more useful to society LOL! Didn't see the auto bar in 2004 when I was there for business. Just the normal little fridge. Oh, and it was all work and no play, which is why I didn't offer any tourist advice! ROSIE: I think you misunderstood the reason for the fridge. It's there to keep your for-pay minibar items chilled (who wants to drink warm $10/bottle beet? ), not for your personal items. In fact, the hotels I've stayed at say exactly that. Sorry for the inconvenience, but it is the truth. Fridges in hotel rooms, especially at something better than the Eaze-on-Inn are no longer the norm. I'm with Rosie. If there's a fridge in my room, I would expect to get "reasonable personal use" out of it, especially when travelling with a small child. Another Mike, is the Eaze-on-Inn a popular chain in your hometown? I am not familiar with it ;) You are quite mistaken, minibars quite often double as the refrigerator advertised by the hotel as a room amenity. I don't care if it is stuffed with items the hotel is trying to sell, actually I like it, it's part of the fun of travelling. What I'm saying is don't inconvenience me by making me dispute charges when I check-out because I moved a Mars Bar a millimetre. Like Felix said, all I expect is room in the fridge for reasonable personal use; I'm not trying to load in casserole dishes or pans of lasagna. I also found this annoying before I had a child... I never finish things and like to put them in the fridge when I get back to my room. I'm with Rosie. A fridge is a fridge. As long as you don't consume or destroy the contents, you shouldn't be charged. In fact, you're probably doing them a favor jam-packing it with bottles of stuff: it saves electricity. I tripped out to the East Coast for two weeks in 2010, and just about every hotel had put in a small fridge and a microwave. Except for the one expensive hotel, funnily enough. 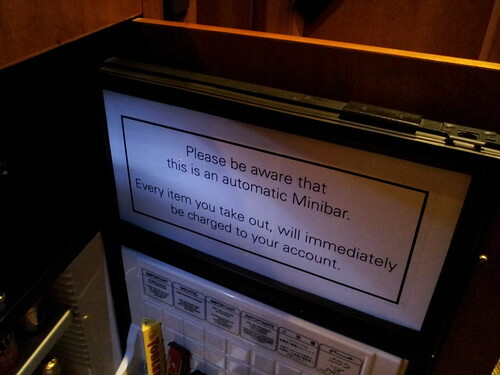 Well, never heard of mini bars, but they sound like good money grabbers like Bell. Avoid them like avoiding Rogers and Bell. It doesn't make sense to have to pay to use a rridge, especially putting your own stuff in it.